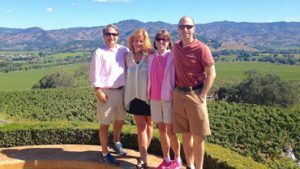 Saint Helena Wine Tours was created and developed locally by Ken and Barbie Slavens. Ken was born and raised in Saint Helena, he brought Barbie to the area in 1976. Ken prides himself on his extensive knowledge of the Napa Valley wineries, Sonoma Wine Tours, and the “behind-the-scenes” history of the Private estates in Napa. He has a strong sense of giving back to his community, running for Mayor in 1994 and serving three terms. Ken continued his work to improve the valley serving as trustee on the Napa County Office of Education board. Ken & Barbie also enjoy custom winemaking, enlisting their family members to create some wonderful cabernet sauvignons and merlots similar to Napa Valley wineries. Saint Helena Wine Tours and Napa Valley Limo Tours is committed to giving you the best service. From the moment you make a reservation with us we strive to be the best. Our solid relationships with local wineries and winemakers allows us to offer our clients the true Napa Valley experience. See how your favorite wine is made, learn about growing grapes, enjoy a meal on a winery estate, sample some of the best wines in the world. We would like to offer each of our clients a personally designed, unique, wine tour experience. We want your trip to Napa Valley to be memorable for a Napa Valley wine tour. Whether it is a Sonoma custom wine tour or an evening out, our responsibility to our clients is to provide prompt service with a genuine smile. Our Chauffeurs go through an extensive training and background check. We only hire the best. Let our chauffeurs and staff help you design your perfect Napa valley Wine Tasting vacation.